Stay in this home rental and enjoy all the reasons Grand Marais is a quiet destination for fantastic Minnesota vacations. Cute and quaint are two words that can describe Blue Lake Bungalow. Centrally located in Grand Marais, you are close to everything the town has to offer. Grab a seat on the front porch and greet locals and tourists alike in this neighborhood home. The living room is cozy and features a large flat screen TV. With the feel of a quaint country cottage, the kitchen is well equipped for preparing meals during your stay. Never miss a thing with family in the living room while you prepare a meal in the kitchen with this semi-open layout. The first bedroom features a queen bed. The second bedroom has two twin beds. More country-like charm can be found in the home`s bathroom. Enjoy a tub/shower combo. Get a vintage feel with the pedestal sink. 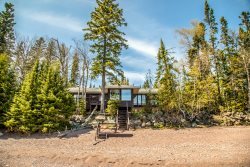 This home is located a short walk from the Grand Marais Harbor area. Enjoy your private deck out back. Have a BBQ or enjoy a home cooked meal on a warm summer evening. The charcoal grill is great for grilling out in the summer or winter if you choose to. Your family and friends will enjoy their vacation in this quaint, centrally located Grand Marais rental home that is near the harbor, marina, North House Folk School, Dockside Fish Market, Artists Point, and the Grand Marais lighthouse. This comfortable and fully equipped home has all the charm of a country home, with all the amenities of a modern vacation rental. A large flat-screen TV with satellite is great for movie night after a day of hiking. WiFi will keep you connected, so you can vacation when you need a break from work, or come and do some work on your break. This pet-friendly vacation home has two cute bedrooms and can accommodate up to four people. The master bedroom has a queen size bed, and the guest bedroom has two twin beds making this rental perfect for families. This is a wonderful place to stay while you enjoy Grand Marais and the North Shore. If your goal is to have an adventure, you have come the right place! Being centrally located in Grand Marais you are walking distance to a short hike out to Artist's Point. Want a more challenging hike? Check out Judge C.R. Magney State Park, just 15 miles northeast, and the infamous Devil's Kettle, a mysterious waterfall that has captivated casual hikers and scientists alike. Or drive up the Gunflint Trail Scenic Byway for a day of hiking or mountain biking on Pincushion Mountain. Looking to just relax? Sit back on the chairs on Blue Lake Bungalow's front porch and have the opportunity to greet locals and tourists alike in this friendly lakeside community. Curl up on the couch in the evening with a good movie or just enjoy the peaceful ambiance that this home offers. Many dining and shopping options are also just a short walk or drive away. "The best things about this rental home were the location, the comfortable yet stylish furnishings, and the decor! A nice big TV with DirectTV plus the WiFi was so appreciated too. We loved the comfy couch, front porch swing and spacious back deck." ~Joanne and John, Waverly, Iowa. "Beautiful back yard, big deck, conveniently located, pet friendly, and fully equipped." Team was excellent. Very helpful and courteous. Cute bungalow within walking distance to town,restaurants, etc. Nice front porch, comfortable living room with large flat screen. We lost power in home for 2 hours and water at a different time for 2 hours, the team accommodated us a couple of extra hours to make up for it. Our family of 4 plus 2 small dogs, loved the home and property, close to Grand Marais, clean, small but charming, suited our needs. The only change would be that the windows be given Screens, it would becomes very hot in the afternoon in the house and we stayed on a cooler week. I most likely would not stayed there again unless the house has screens in all the windows. The house was great for us. The location was nice because we could walk to many things in Grand Marais. This is THE place to stay in Grand Marais. Comfortable beds, great kitchen and amenities, Fabulous location. Great porch and decks. We loved it. like above mentioned cascade stands behind their properties if there is a problem, that is why we are return guests. customer service and satisfaction are we feel important to Cascade. good location in town but not in a high traffic area. Close to many things we wanted to visit. We loved the Blue Bungalow. It was an excellent size for us and a great location. We could walk to the center of Grand Marais and yet were far enough away that we were not inconvenienced by the amount of people and traffic there. We had our breakfast on the back porch in the mornings. which was a real treat. The house was better outfitted than we expected. The only problem was the garbage situation. We thought that if recycle and trash containers were available we could separate things as required and for the amount we payed Cascade should have then collected it after our visit. It was perfect location. We walked everyday to town and adventured off the gunflint trail.